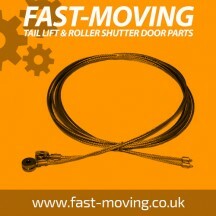 Dry freight roller shutter door cables. Made from quality steel wire rope for maximun strength and performance for your dry freight roll up door. Can be made to any size. If you cannot see a size you would like to purchase or for any dry freight requirements you may have please call 01733 558224. Cables can be supplied galvanised steel or stainless steel. Our replacement cables are suitable as some replacement components of many door types including :- Dry freight, Coldsaver, JR Industries, Whiting doors, Mobile doors, Henderson doors,Todco doors, Boyriven FIT doors.